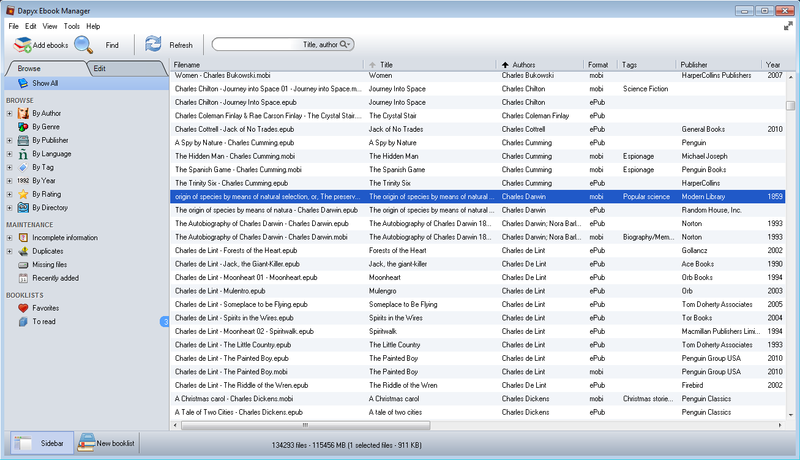 If you have a sizable ebook collection and you can't ever find the ebooks when you're looking for them, then Dapyx Ebook Manager is the perfect software for you, helping you find and organize your ebook collection. It reads meta information (such as title, authors or covers) from formats such as ePub and mobi/azw, you can make booklists and read ebooks on your computer. Qweas is providing links to Dapyx Ebook Manager 1.0.2 as a courtesy, and makes no representations regarding Dapyx Ebook Manager or any other applications or any information related thereto. Any questions, complaints or claims regarding this application Dapyx Ebook Manager 1.0.2 must be directed to the appropriate software vendor. You may click the publisher link of Dapyx Ebook Manager on the top of this page to get more details about the vendor.